SOLVE THE PROBLEM BY STOWING YOUR JACK UP AND OUT OF THE WAY! Solid Steel Construction Durable Powder Coating Universal Bolt Pattern Fits Any Side-Wind or Electric A-Frame Jack with triangular mounting bracket Made in USA Includes receiver mounting hardware WITH JUST 1/6TH OF A TURN YOU CAN QUICKLY RELEASE & COMPLETELY REMOVE YOUR JACK FROM THE TRAILER Jack-E-Up is the device to get your jack, off of your trailer. 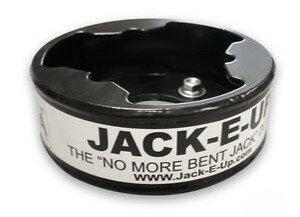 The Jack-E-Up fits any 2 3/8 inch diameter or smaller top wind, side wind, or electric triangle-mount based jack.